i imagine that it all falls in a heap once you extend the engine braking down a long continuous hill for which i believe the feature was installed ...i would have loved to see some interaction of the speedo pulse counter involved in the kill injection process ie count 300 before turning off if no throttle is open ....personally i only know of just a few locations where this would happen in at least 600 ks from my place .most if not all bring you back on throttle durring the descent ..or is that the way i ride anyhow ? i think there is enough anecdotal evidence on here and other forums and places that prove that this process has little effect on the running or longetivity of our old girls and their performance . for me ....i love it ...it certainly has smoothed off the performace of hills and twistys with far less dramatic change in bike balence fore and aft durring critical line setups in and around corners . and cetainly looks after the transmission and wear on tyres due to such changes ...especially round town . I see your point - Clearly. I was taking exception in general with the idea of just disconnecting all kinds of stuff for the main reason of "it doesn't do anything, anyway. Would you concur with my idea that the best way around the symptom (if you can't live with it) is simply to "un-adjust" the switch slightly so it can't quite close at the lowest throttle opening, hence preserving it's other function at WOT? I imagine that my other argument about reduced emissions is a weak one but it still bears consideration. happily i have now after 40,000 + kilometers in a little over 2 years ...what i call... a well balenced "old mans bike " capable of huge distances ...and a real quick blast up in the hills . the old girl sings and can spin on a penny . and that helps a lot . subjective yes ,,,enjoyable ...absolutley . I might just do that with mine. Since I have the fairings off right now. Just have to move the adjustment on the TPS a tiny scoach.......so it can't quite switch on at the bottom end. @ibjman wrote: I might just do that with mine. Since I have the fairings off right now. I think that test-and-see approach is the best way to deal with issues like these. As I ride a naked bike unplugging the thing was the best way to test if it was worth going through the process of micro adjustment. I kept it unplugged for a few tank loads to make sure. @Charlie: Yes I think that you are correct about the pollution control angle. In this case the early analogue EFI system just didn't have way to easily deal with fuel control. I note that once "computerised systems" were introduced all of that was junked in favour of sensors that provided information required by the CPU to provide provide fine control of FIs. When I got my bike, the first thing I did was to replace all the rubber components and seal all air and vacuum leaks, test the fuel injectors and fuel pressure. After doing that and after tuning TBs I was still left with a problem of not being able to take hairpin bends and small round about turns smoothly. That brought me to investigate and making sense of the TPS control, ie disconnect it. Armed with the memory of a super smooth Honda CX500 (shaft drive) and disconnected TPS I was well pleased with the bike performance. After that I simply "tuned it out" to keep the full throttle function as described above. This works for me because I do a lot of riding along our coastal roads and national parks. These are tight and twisty roads there smooth bike is appreciated. Once on the highway and high speed corners this mod has absolutely no effect and for folks who spend a lot of time riding at high speed this mod is a waste of time. Now.....since I haven't "re-diddled" mine yet.......Maybe I'll over engineer this a bit more.....just to see what results. What would happen if......I insert a relay in the wire from the "closed throttle" side of the TPS. The relay makes & breaks the signal feed to the EFI computer from the TBS. 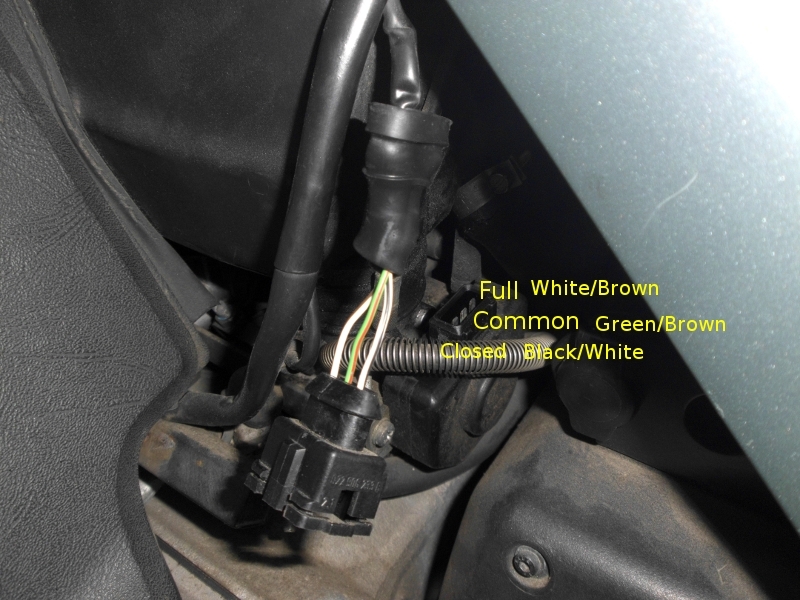 Connect the trigger wire for the relay to the rear brake light switch circuit. (Let's disregard for the moment, the effect it might have on the bulb check relay function, I'm sure we can figure a way around that). In this scenario, an additional parameter has been added to the fuel off switching. #1 Throttle completely closed, #2 Engine RPM above 1500 & #3 rear brake is applied. If I'm seeing this right....it would aid braking slightly while still eliminating the throttle lurch (assuming, you "twisty guys aren't modulating the throttle while the brake is applied). the problem is after cuttoff it takes a little while for the cylinders to recharge and power to come on ...remember the throttle overshoot by the rider waiting for the power to come on ? I think you have a good point......still after some experience in this config.....the driver might naturally adjust to lifting the brake slightly before he wants throttle???? I think I'll probably shelve the idea...it was only a what if. Sorry all if I've re opened a can of worms! I've found it beneficial so far, none of the jerks associated with on off throttling and also I dont get that momentary surge as you are slowling down to stop as the injectors come on again, which usually made me have to adjust breaking at the last minute just prior to stopping, all is much more fluid. Will try the anti clockwise adjustment of the TPS and see how that goes. Then at least its all still connected. Not at all Andy. It is always good to open these old threads and pass on good experiences people have had with tips and ideas. TPS Not your idea ibjman. Look earlier and you will see Ajays had been all through this and suggested just that. Reset low to cut out the first switch rather than disconnect which causes backfires. aye ..! indeed ajays ...many thanks . i hope i have passed on your wisdom well enough . Ok, AJAYS.......I stand humbly corrected. As you know it's hard to remember all the 1000's of previous posts about any specific topic. If I could do that my name would be Inge? At any rate it appears that I am not the only one who had failed to remember or not completely read your idea, so IMO it was beneficial for me to re-state it...... .
To dig up the thread again. I came across this last week, and after reading through it, decided that it made a lot of sense. So, I then went out and adjusted the TPS to deactivate that low switch. Took all of 10 mins. What can I say, the bike behaves like a "normal" bike again! No more low speed jerkyness, and a big difference in gear changes, especially 1st and 2nd. Most of my riding is in town/twisty corners, and as others have said, the on/off of the fule injection shut off was a pain. You do work around it, but now, since I also ride a transalp, it is more noticable. This has been one of the better mods I've performed (this, and advancing the timing to 30 btc ). On a side note, I went for a spin yesterday on our back roads. Man, this bike is fun. Keep it above 4k revs, and closer to 6k and (with a remus race can) it really sings. I keep thinking of selling it when I get a K1200LT next year, as I have the transalp for one-up and will have the K1200LT for two up touring. But I know I cant sell it. It scratches an itch that neither of the other two can do. Looks like I'll just have to extend the garage. I just unplugged the TPS and it runs smoother, no more "hiccups" while slow cornering. I will install a switch on the wire of the throttle closed switch, so I can turn it on for long downhills. The K is tamed now, doing what the throttle says, not interpreting informations, calculating how to improve my riding style for better fuel efficiency, environmental impact, or whatever else. Just a plain obedient machine. 2005 Yamaha PSR E-203 (Keyboard Synth). @Corkboy wrote: To dig up the thread again. ... I keep thinking of selling it when I get a K1200LT next year, as I have the transalp for one-up and will have the K1200LT for two up touring. But I know I cant sell it. It scratches an itch that neither of the other two can do. Funny you should say that. I did just that, bought a 1200RS and enjoying the power and smoothness of the beast, but prefer to ride my K100RS. Yes, the TPS has been disconnected years ago precisely for all the reasons you describe and since then I've been reluctant to part with it despite the 1200 which i prefer to take for longer rides. I've just cut the Black/White wire. Will fit a switch later. Never again ! Thanks but, no thanks. Easiest "mod" ever, nothing to take apart. 1. Yes, I've disconnected the vacuum hose to pressure regulator a long time ago. My fuel pressure sits at 36 psi and I've not noticed any difference in fuel consumption. 2. I've seen people play with the flap sensor, but I had an impression they did this to adjust the mixture or to move away from a warn out sliding connector spot. I didn't play with that because the bike idles just fine and has no flat spots on take off. So, no real idea what effects it has on performance. 3. On deceleration ? I ride often up and down the Macquarie Pass and coast escarpments as well as National Park and suburbs. I have no problems with backfire provided I wind off the throttle completely. In other words you are in control of this. I think that effects on performance and fuel consumption by disconnect of TPS and Vacuum hose is of secondary importance. I haven't been able to measure fuel consumption differences. TPS disconnect (or adjustment) improves things for technical riding and absolutely no effect on highway cruising. I think that most of us are clear on this. Vacuum? ...well for me, disconnecting it simply decreased micro vibrations and made things smoother. Otherwise no effect. Hey Ya'll, Gotta say I got so engrossed in this thread I lost track of who reopened it but who ever did, my wife thanks you because the one thing she dislikes about the K100rs is knocking helmets and sliding forward on the seat...though I have no objection to the latter...and I thank you because riding the Blue Ridge Parkway here in Virginia the road is loaded with VERY tight turns and the herky jerky motion just can ruin a nice tight curve...on the road that is. I do like Beemers idea of a switch to utilize the engine brake on steep down grades. And a big thumbs up for revisiting an old thread like this cuz there is so much good info on this forum that we newbies can't always dig it up fast enough. I'm looking forward to trying this out as soon as I get her back on the road. Oh and for this HVAC guy what the heck does TPS stand for. I just lucked out that someone put a pic up so I know which thingamajig to fiddle with. Look for ya on the road ! @ironbutt wrote: Oh and for this HVAC guy what the heck does TPS stand for. I just lucked out that someone put a pic up so I know which thingamajig to fiddle with. It only takes one minute and some cutters to neutralize all that immoral (helmets) banging. Thanks Ned anyone doing Maquarie pass without issue is sure got the goods on fuel management, I'll be sure to bring a seegar with me when my scoot is up and running, Owe Rossco my half of the bargin from earlier this year so to meet you two would kill two birds with the one stone, or is that get you two birds stoned oh no cant be right, the policeman will be watchin me now. @K75cster wrote: Thanks Ned anyone doing Maquarie pass without issue is sure got the goods on fuel management, I'll be sure to bring a seegar with me when my scoot is up and running, Owe Rossco my half of the bargin from earlier this year so to meet you two would kill two birds with the one stone, or is that get you two birds stoned oh no cant be right, the policeman will be watchin me now. The best thing to do is to convince your self with your own experiments doing the things you normally do. My suggestion is to simply disconnect the plug for a tank load or two and check the consumption and effects. Take one variable at a time.. ie. TPS first then the vac house with TPS then back to standard. You will without doubt form an opinion very quickly. One seegar and two beers is about my limit Yes, we should meet somwhere half way, but you have to give me a week or two. How could the 2 preceding owners ride for 27 years with that closed throttle aberration ? That is beyond my understanding. There is NO WAY you could get me to turn it back on. Except occasionally coasting down long hills, at the flip of a switch. I' wouldn't reset the timing back to standard 6° BTDC either. I've been following this post with some interest! My K1100LT is very sensitive to throttle openings at low revs and does ride more than a little jerkily in low gears and at low revs. But the settings for the TPS are different to the K100's etc. From memory, you connect a multimeter to pins 1 & 4 of the TPS and set it at, I think, 0.370v or close to. But has anybody any idea as the the setting to smooth out that low speed jerkiness??? Disconnecting the TPS entirely allows the engine to start but makes no difference to the rideability. Well Keef if you figure a way to do it do tell me and all the other K1100 riders as we would like to know. The K1100 do delay the cutting in of the fuel cutout by anbout 1.5 seconds which does help but not solve the problem. I have a fuel computer on my K1100 and it reads the injector pulses so when it reads 000 it means the injectors have been cut. So it seems to be one of those "they all do that, Guv" style of thing then? Bu66er. The best I can do, at the moment, is to ride with the cold start lever slightly open, raising the idle speed to just a little over 1k. It makes gearchanging smoother and low throttle riding better. But it's not really a full solution! Like some automatic unwanted extra braking ? Ned Sorry to hear of your damaged pride, glad the wing is OK though. I rode with one finger on the brake lever and naturally got in the habit of holding the throttle at about 1mm off closed sometimes more depending on the need and the bumps i was dealing with. When the 75 is back up and running I will have a go at the tps trial and the vacuem trial. The K1100 throttle is much more conventional than the K100 and airheads. I doesn't have the gear drive and chain which dows make for a better throttle to use. Thanks mate... it was both embarrassing and bruising but the old girl got away with nothing more than a scrape on the tappet cover bolt. I do the same and never really close the throttle fully. I also use the same technique with one or two fingers on the brake lever and I tend to ride by using the gears and when i need more engine drag, I simply go down a gear or so. I guess that this is an old habit that comes from riding sports and dirt bikes. Bad luck Ned glad you are relatively OK and bike is good. I still miss my Wing. Strangely enough I was talking to a very good friend last weekend who had cracked a few ribs falling off a kerb of all things. His daughter is a doctor and she said take lots of painkiller to suppress the pain and try to cough often. The problem she said is because it is painful to cough we suppress that and the risk of pneumonia skyrockets. @K-BIKE wrote: Bad luck Ned glad you are relatively OK and bike is good. I still miss my Wing. Strangely enough I was talking to a very good friend last weekend who had cracked a few ribs falling off a kerb of all things. His daughter is a doctor and she said take lots of painkiller to suppress the pain and try to cough often. The problem she said is because it is painful to cough we suppress that and the risk of pneumonia skyrockets. Yes, I do see what she means about no clearing the lungs thing. Thanks for that as I didn't really think about this problem in those terms. It is definitely a good piece of advice. I am getting much better and mobile. Thought about a ride on the weekend but needed to attend to the carbs I got for the Wing. This week will see me return to the gym for light workouts and maybe the next weekend will be the first ride back, on the K100 this time. @Beemer Wheeler wrote: Thanks guys ! Did you install the switch on the 'throttle closed switch' wire?? Runs just fine, went from Zeebrugge to Terneuzen (seegars) and back via Sas van Ghent, 150 Km. What would it do if it would be turned too far? I mean how would the bike behave? I just did that adjustment today on my bike. Tried to do it so that it would not go too far, but how can you really tell? It is not fully twisted and it does not click anymore at throttle off. Then again it does not click full throttle either, but it did not do that before adjustments. On my older bike TPS is not functional and it runs very smooth from very low rpms (5th gear 40km/h). But that bike has some kind of operation done to the engine channels (do not know the words in english). My current bike suffers from twitching under 2500rpm and TPS adjustment maybe did improve it a bit, but not all. @Tenox wrote: Then again it does not click full throttle either, but it did not do that before adjustments. They don't click at WOT, it's a different kind of switch. Quite an interesting read as I have gotten used to the 'engine braking' at the TPS allows for and use it a lot. I like the shifting down and braking on the engine before entering a curve and the roll the throttle open and accelerate out of the curve. With regards to the reason it was fitted I don't think the environment was a concern at that time (development late seventies), I think it was for fuel consumption management reasons. Don't forget that we had some difficult periods in Western Europe around that time, where they prohibit using cars etc on certain weekends/Sundays because on fuel capacity/price concerns. That learned everybody that a more frugal engine was desirable. (probably showing my grey hairs here :-)). @ReneZ wrote: Quite an interesting read as I have gotten used to the 'engine braking' at the TPS allows for and use it a lot. I like the shifting down and braking on the engine before entering a curve and the roll the throttle open and accelerate out of the curve. "Quite an interesting read as I have gotten used to the 'engine braking' at the TPS allows for and use it a lot. I like the shifting down and braking on the engine before entering a curve and the roll the throttle open and accelerate out of the curve." I like driving with engine braking like you described too, but I actually did not notice significant difference with or without TPS on that. Or on my older bike compared to newer with TPS working. But what about that question of mine. If TPS/WOT would be on all the time, how would the bike act? Would it be clearly different or would it just consume more fuel? If in doubt: at WOT pin 18 and 3 (center and right) at the TPS should be connected. I know I sound (am) stupid, but how do i test this thing with it? measure 0 ohms at WOT and a open connection in all other positions. Thanks again Inge. I will test both bikes. I think though that I need someone to twist the throttle for me, but I will see. Oh I feel more idiot than normally. I have no idea how that plug on TPS is unconnected. I hope it does not need screwdriver on both sides since there is no room. I don't want to break anything so I just ask even it makes me look stupid. How is that unplugged?